Recently I ran across an article by Dr. Roy Ward from the September 29, 1988, edition of The Oconee Enterprise. I had kept the article because as City Attorney and County Commissioner, I had dealt with some legal issues relating to the park area. The park centered around a well and the marker. Over the years, I have heard stories about the park and the well. It is an interesting piece of history for Watkinsville and Oconee County. 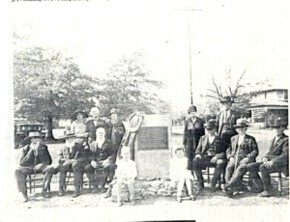 The scene depicted the unveiling of a Marker on Confederate Memorial day believed to be around 1927. The monument and scene is near the middle of what is now Main Street. The monument marker still sits on the Courthouse lawn. Future generations will enjoy such photographs and snippets of history that folks like Dr. Ward and local photographers saved for all of us. A photograph may, in time, become redolent with history. This one, per­haps the only pictorial record of a local Confederate Memorial Day ex­ercise is especially evocative. The veterans are: B. A. Maxey, R. B. Harris, W. H. Anderson, J. M. McLeroy, J. G. Hansford, J. F. Osborn, W F. Phillips, and J. L. Miller .The ladies are: Mrs. Annie (Billups) Johnston, Mrs. Florine (Langford) Meaders, and Mrs. J. A. (Lucy) Wi1son. Now that our Memorial Day itself has been abolished, and even that once-revered flag reassigned as a standard for hooligans, not much is published about it. Before we all confine it to the dust bin of history as if the Confederacy itself had been born in shame, we might reflect that when the United States was founded, the fact that it was an experiment in union was acknowledged, and the future right of any state to secede was guaranteed. As authorities are prone to do, the union government, after first condoning secession, reversed itself. Moral issues, in this case slav­ery, cloak the contradictions of gov­ernment whose real interest is in power and wealth. Perhaps our union, universally considered as voluntarily dissoluble, before 1860, had to be reborn in great pain, and at great cost, to become what it is; and possibly that is to our good. We will never know, because when one path has been taken, we give up the knowledge of where the other paths would have led. The occasion illustrated is the un­veiling of the Confederate Memorial Marker. The monument, on its very substantial rock base, stood veiled in the Watkinsville City Park, a tree-shaded grassy area containing the public well and dividing what is now Main Street between the court­ house and those structures across the street from it. The monument, appro­priately enough, faced south. After, bountiful dinner in that park, the attendants adjourned to the court­house where Mr. John W. Jenkins, delivered what was called an eloquent address. Returning to the monument, "Colonel" Robert Ashford delivered an­other address in which, among other things, he said: "We justly liken our veneration for our heroes of the Confederacy to that bestowed by historians upon the knights of old England, from whom were derived the ideals of chivalry that made the South's leaders as jealous of the honor as of a gift from God." The children then pulled the shroud from the granite. When the park was cut through in the 1930's, the area to the west became, in time, a parking plaza for the courthouse. The area to the east became front yards for buildings which, until then had little or none. The large ancient "hotel" (a site now occupied by the new Eagle Tavern) was outside the range of this photograph. The other large building, on which persons can be seen on the front porch, had also served as tem­porary quarters for persons needing to stay in town for court, when Watkinsville served as County Seat for what is now Clarke County. ……..
Seen between the monument and Mrs. Wilson (the lady with the utility pole sprouting from her head) is the area of Dr. White's old office, a site on which our present William White built an attractive new office building…..